Present Image kan med glede presentere håndplukket kunst fra artister fra mange land. Denne kunsten er for den kresne. My collaboration with Present Image represents a really exciting opportinuty for me to work with someone from another country and culture, to explore what I can offer and of course, what ideas and inspiration can be offered to me. It is a collaboration I am really looking forward to. My art is very much based on immediate inspiration, capturing a moment or a visual element as quickly as I can. I don’t like to lose the essence of something through overworking and the use of excessive ‘layers’. Stripping things back therefore works for me – ‘less is more’ in many ways. 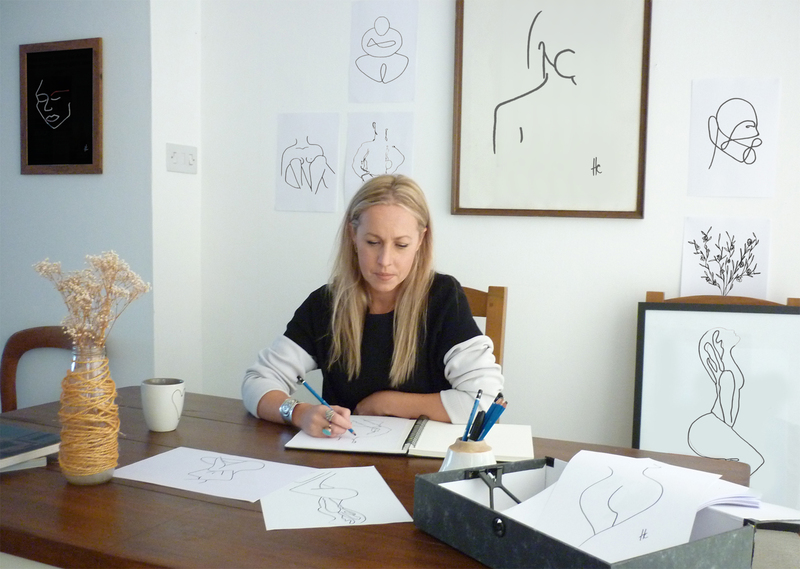 I often refer to myself as an ‘accidental artist’ because I love how a source of inspiration can be anything, at any time and very much from anywhere – a performance, an inanimate object, a gesture or even a knot in a piece of wood. I grew up in Wiltshire, a fairly rural area in the South West of England. I always had a love of drawing and an appreciation of art, but various circumstances ultimately meant I didn’t take it as far as I would have liked in my younger years. Having grown older I have had the opportunity to travel extensively and even live in both a foreign country and environment. This exposure to new things, new ideas and cultures has allowed me to fulfil the passion for creativity that I’ve perhaps previously limited to practical and ‘safe’ forms at various stages of my life. I now live on the small Channel Island of Jersey which I am only really beginning to explore in terms of its identity and what it has to offer creatively. Geometric mid century no4 er en moderne plakat med abstrakt motiv. Geometric Mid Century No3 er en nydelig plakat med abstrakte former.